A compilation of completed Aggregate Resource Mapping GIS data is now available in a new interactive web map application. Plate A: Aggregate Resources Potential, Carlton County and Fond du Lac Reservation. Please note: Best results in viewing these plates will be obtained by saving the files to a location of your choice and opening with Adobe Acrobat. Some plate information may not display as a result of opening with Acrobat directly from a web browser. A compressed set of files, carldata.zip. This compressed set of files is 5.6 MB. 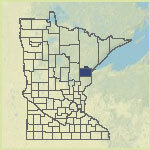 It contains ArcView shapefiles, ArcGIS file geodatabase, and related dbf files of geological and aggregate features created by the DNR, MNDOT, and MGS. Also included are metadata files in HTML format for each data file. Summary of datasets included in the carldata.zip file.